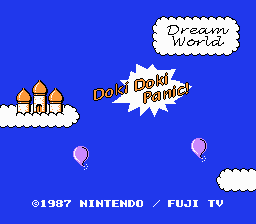 Dream World: Doki Doki Panic! Yume Koujou: Doki Doki Panic is an action platformer game for the Family Computer Disk System. This is the game that Super Mario Brothers 2 was based on. When Nintendo released Super Mario Brothers 2 (The Lost Levels to us Americans) in Japan, its popularity was eclipsed by this game, which came out at about the same time. So Nintendo in all their wisdom decided to hack some Mario characters into it and release it as SMB2 stateside. There are a few more differences than the character changes. Gameplay wise, this is almost exactly the same as SMB2, so if you’re a fan of that game, or of the Mario series in general, you should give this one a whirl. This is an English translation of Yume Koujou Doki Doki Panic for the Family Computer Disk System. Headerless version of this rom is 84018D5E. You MUST patch a rom with the header. If you patch the headerless rom you will have a garbled title screen. Unknown if there are other bad effects. If you can't find the version with a header, add the header below with a hex editor.